Indian Rag Papers are handmade using recycled, refined cotton from rags, clothing and textiles. 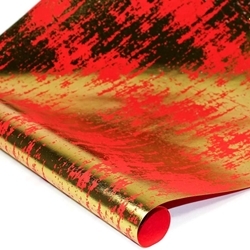 From this durable, acid-free base paper, an overlay of gold foil jumps off the eye-catching red page creating a stunning design for your project. Inspired by textile patterns and colors, Indian Cotton Rag Papers make outstanding papers for all art and design applications. Indian Rag Papers are crafted by hand using recycled, refined cotton scraps from rags, clothing and textiles instead of pulp from the cotton seed as other papers. The longer cotton fibers in the paper prove exceptional strength and durability. From this rugged base paper, a shiny metallic gold overlay is silkscreened on the deep red paper creating a visually unique design.